I love the clothesline activity and have used it with students in the context of fractions, decimals and percents. When I first started using it, it would be up with pre-marked benchmarks on it and as we talked about relationships and equivalencies we would add them in relation to the appropriate benchmarks. For example, 0 and 1/2 would be already up on the line and in class the students realize that 1/4 is half of that distance, we would put the 1/4 on the line between the pre-marked 0 and 1/2. It was always a work in progress and it was a nice visual, but static. After designing a PD with Jody Guarino, I realized the power in having the pieces be constantly movable. So we started with an empty number line and students drew fraction cards to put on the line one at a time. Now, there are two ways to launch this… either the students know the range of the cards they are using or they do not. I prefer the do not, but I see benefits and places within grade levels/units that each would be appropriate. Student 2 draws a 2, places it at the end, but then has to adjust where the 1/2 is placed because now 1 must be in the middle of the clothesline. Makes the necessary moves. We of course as why they adjusted the way they did and how they determined how close to place the fractions to the other cards. Student 3 draws 3/2, no adjustments are necessary at this point, but the student must estimate where 1 would be and do half of the distance to 2 and place the card OR take the 1/2 distance and replicate that three times. Either is awesome. Of course, we ask all kinds of questions about their placements. …and play continues, but if a 3 is drawn, then things shift tremendously…the fun part is students don’t know so they cannot have their spot pre-planned and everything is adjustable! 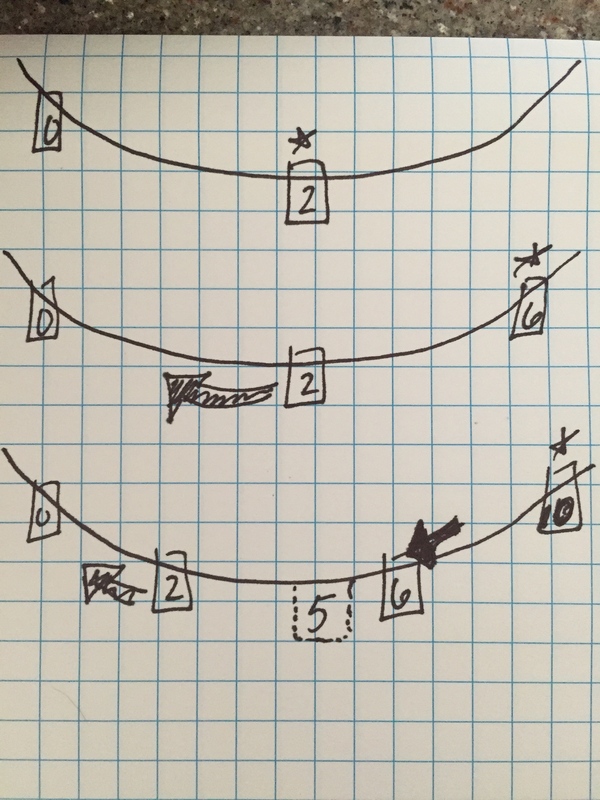 After Andrew’s post, I started thinking about two things…what could this look like with whole numbers and what are the differences between starting with a set on the line to move around vs drawing cards and placing them where they go? I tried to sketch out a few moves and think about what students could be thinking about as they went. I am sure I have not captured all of the possibilities, so I would love to hear ideas in the comments! So, we could be looking for students to place the beginning and end (0 and 6) first and then I would be curious to see if they placed the middle number before dealing with the other numbers (line 2). Or, would students order left to right, least to greatest (line 3)? Would be interested how they think about spacing the cards in this situation, do they touch? Is there the same distance between each? What would they think about if we gave them a card with 10 on it after they finished arranging them on the line? Now, what if we started with just a zero at the left and didn’t tell students what range of numbers we had? Then, let’s say the next student draws a 6. They place it at the end, again assuming it is the highest number and then has to adjust the 2. We ask what their thinking was and hope to hear something like “Since 6 is the end now, 3 must be in the middle and 2 is less than 3.” There could also be some questions around how close the 2 is placed to the middle versus toward the 0. Cool stuff. (line 2). Next student draws a 10, now the 6 shifts left, just right of the halfway point though because that would be 5. Then the 2 has to shift because the 6 did. Now, interesting questions about all of those moves come out..How did you decide where to place 6? Why did that affect the 2? How does the distance to the 2 relate to the distance to where the 5 would be? to where the 6 is? Andrew played around with the clothesline with his son here. Great stuff and so many ways to think about how we could use this in our classrooms across all grade levels! Thanks for the inspiration to blog this Tim, Chris and Andrew! This entry was posted in Clothesline, Number line and tagged Clothesline, Number line on August 23, 2015 by mathmindsblog. When dealing with whole numbers (as counting numbers ) it is only the order that matters, the spacing is not important. Introducing fractional numbers changes the number system into one for measuring, and suddenly the spacing matters. This distinction is vital to math. Thanks! Definitely a distinction to be made for sure with counting versus distance. However if we are viewing the number line as a distance model, wouldnt the spacing of whole numbers be important? Interesting to see how this thinking evolves from counting to then spacing being important. There is a REAL difference between 3 apples and 3 miles, not only because I cannot hold a mile in my hand. I may sound pedantic on this one, but consideration of meaning is vital when entering the potential quagmire of negative numbers. I completely agree and not pedantic at all! I appreciate this conversation! I suppose applying a context before you started would also set the stage, but I think examples coming from the students would be my preference. “How tall are you?” is a simple start, if they can’t come up with something. Or maybe “How many grains of rice in this jar?”, which forces a move from counting to measuring. Love this post! I am sharing with our math teachers – it makes math concepts more concrete and visual. Thanks for sharing! Totally diggin’ this! Looking forward to more posts and seeing this idea reflected in your students journals.